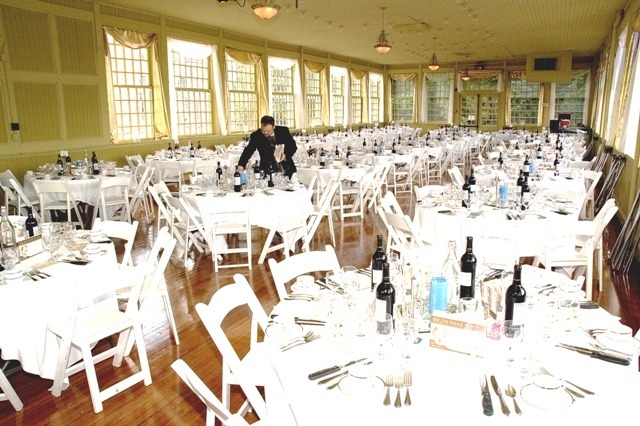 This beautiful Ballroom maintains its original form and features hardwood flooring and original stained glass windows from 1905. 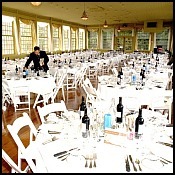 This room also has a large existing stage, ceiling dimmer lights and two beautiful antique wooden doors for privacy. The main foyer may also be available to you and your guests. 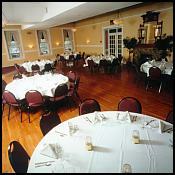 The Ozark Room gained fame as the original restaurant at the Basin Park Hotel. Hardwood floors and in-room fireplace with mantel accent the spacious surroundings making this room ideal for weddings, group meals, evening entertainment, and theater style meetings. The Ozark Room measures 1700 square feet, is unobstructed and features surround sound. A Victorian-style, glass-ceiling garden room that is the only one of its kind in the Ozarks. 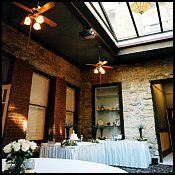 With 855 square feet of atmosphere it is ideally suited to intimate dining, afternoon cocktails, weddings, parties, receptions, and small group meetings. Enhancing the features of the room are a built-in 9x12 projection screen, mounted LCD projector, surround sound with DVD, Cassette and CD players.